Two veteran spacewalkers who just arrived aboard the International Space Station last week are set for a six-and-a-half-hour excursion on Thursday to install wireless communications equipment outside the orbiting laboratory to prepare for the arrival of a high-profile ecosystem remote-sensing instrument later this year. 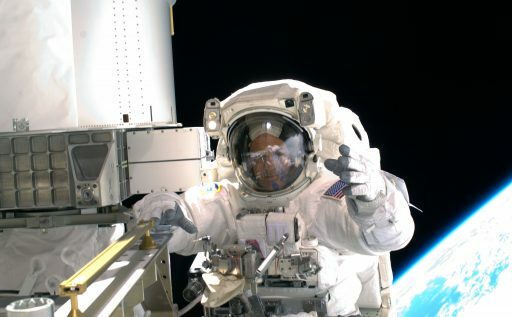 Hubble repairman Drew Feustel will be joined by Ricky Arnold on Thursday; both have prior experience working outside the Space Station during its assembly phase. 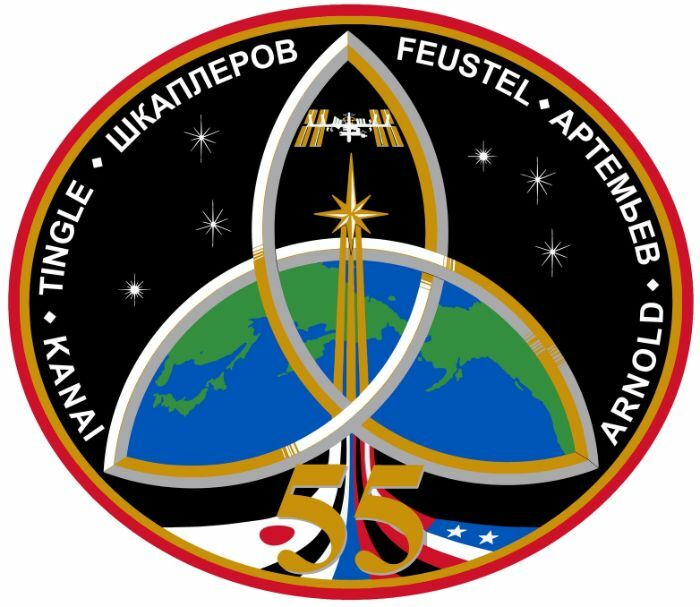 Three primary objectives are on the docket for Feustel and Arnold: first and foremost will be the installation of the communications gear needed by NASA JPL’s ECOSTRESS payload that is flying up to ISS on the Dragon SpX-15 mission this summer and relays the ecosystem data it gathers wirelessly to the Station’s internal data system for storage and eventual downlink. Its installation location necessitates an expansion of the external WiFi on ISS to ensure good connectivity with the instrument. 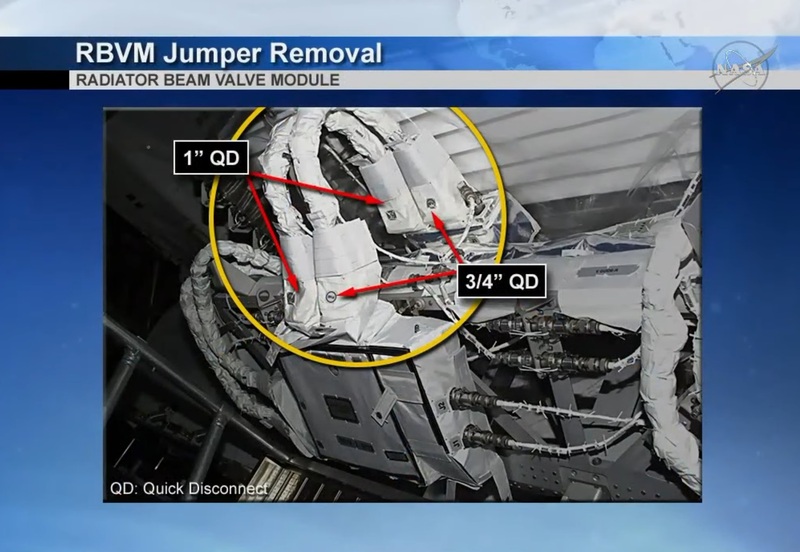 The second task will see the crew remove a pair of fluid jumpers from an external Radiator Beam Valve on the Port Truss of ISS to return to the ground for inspection of a potential leak on one of the jumpers. The third task lined up for the EVA is the replacement of a camera group that lost its ability to pan and tilt upon ground command. With two experienced spacewalkers heading out the door and a fairly light task list compared to previous ISS EVAs, Mission Control is hopeful that the duo may get to a number of get-ahead tasks to get a leg up on EVA activities originally lined up for later this year. 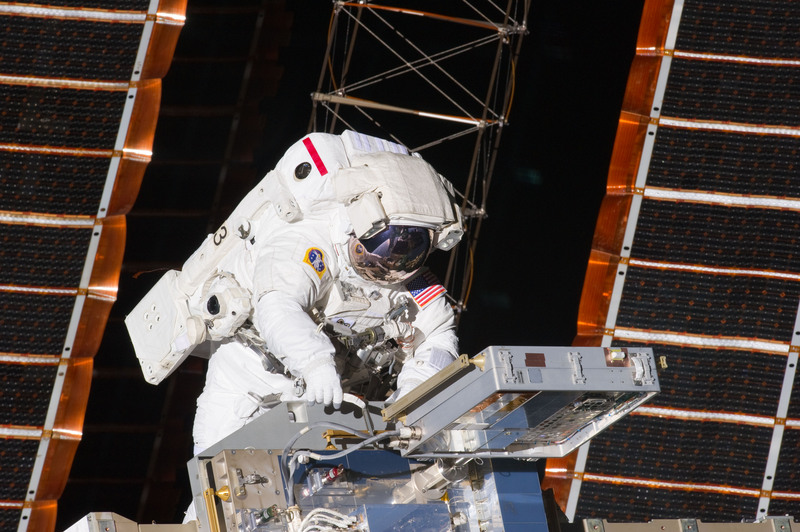 Thursday’s spacewalk, designated EVA-49, was moved up from a prospect date in May on fairly short notice, only showing up on the official ISS schedule in the first half of March. Events moving to the left on any spaceflight schedule are a rarity, but for Station are somewhat more common as managers desire to fit non-utilization activities into periods with reduced crew time requirements for science and visiting vehicle support. 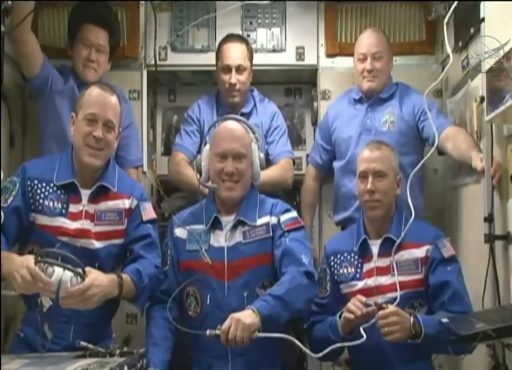 Such a period presented itself at the end of March, in between the arrival of the Soyuz MS-08 spacecraft with the Expedition 55/56 crew members and the Dragon SpX-14 mission that will send the U.S. Segment into a sprint throughout April to complete related cargo and science operations as a number of experiments riding up on Dragon will have to return aboard the same spacecraft. With a lull in science activities as things calm down before Dragon and a crew of six aboard the Station, managers saw an opportunity of moving one of three planned EVAs from the May/June time frame to the end of March to clear up some time in the crew’s schedule down the road when things are likely to be busier from a utilization standpoint. An additional driver behind moving the EVA forward was the desire to have the Node 3 wireless antenna system in place with plenty of time left before the ECOSTRESS payload arrives aboard ISS, currently looking at a June 9th launch date. Conducting spacewalks within the first week of a new crew’s arrival aboard the Space Station is not considered an ideal scenario, though NASA and the two crew members stepping outside on Thursday have plenty of experience with performing EVAs shortly after getting to orbit as was standard for the Shuttle Program. 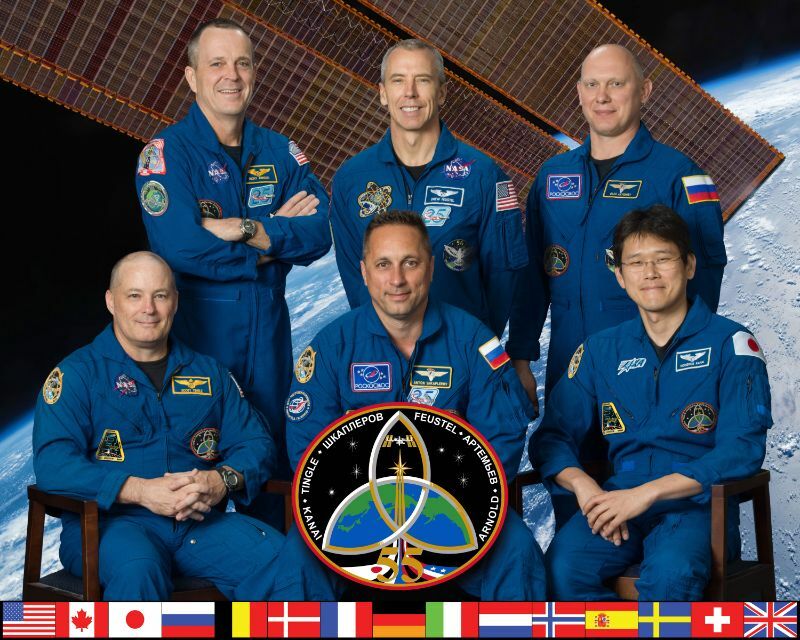 On their previous missions, Feustel and Arnold performed EVAs on days 3 and 4, respectively, whereas Thursday’s EVA comes six days after their arrival on ISS and eight days after lifting off from Baikonur aboard their Soyuz. 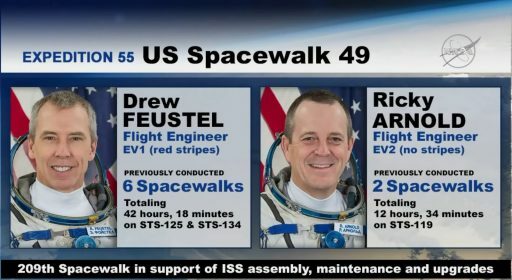 Serving as the lead spacewalker, Drew Feustel will be wearing Extravehicular Mobility Unit #3006 with red stripes while Arnold will be donning EMU #3003, an all-white suit. Going into Thursday’s excursion, Feustel stands at six career EVAs for a total of 42 hours and 18 minutes performed on the STS-125 Hubble servicing mission and the STS-134 assembly flight to ISS while Arnold has 12 hours and 34 minutes under his belt on two EVAs performed on the STS-119 mission in 2009. EVA preparations have been underway before the EV crew arrived aboard ISS as USOS crew members Scott Tingle and Norishige Kanai, both veterans of one EVA, readied the two EMUs. Feustel and Arnold began setting up shop in the Quest airlock on Sunday by preparing the tools and bags they will take outside with them and they also went through final in-orbit procedure reviews – aided by 3D simulation software as well as the out-the-window view of their worksites. The start of the EVA is planned at 12:10 UTC when Feustel and Arnold will switch their space suits to internal power inside the depressurized airlock before heading outside. 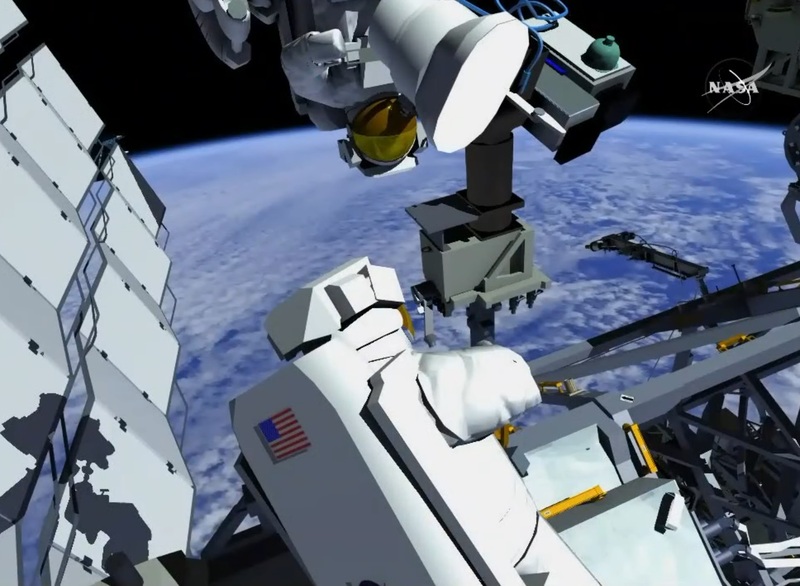 After the typical setup steps related to safety tethers and suit configuration, the duo will split up to kick off the EVA by working on separate tasks with Drew Feustel headed aft and port to the Node 3 endcone while Ricky Arnold translates along the Port truss until meeting Canadarm2 to take a ride. 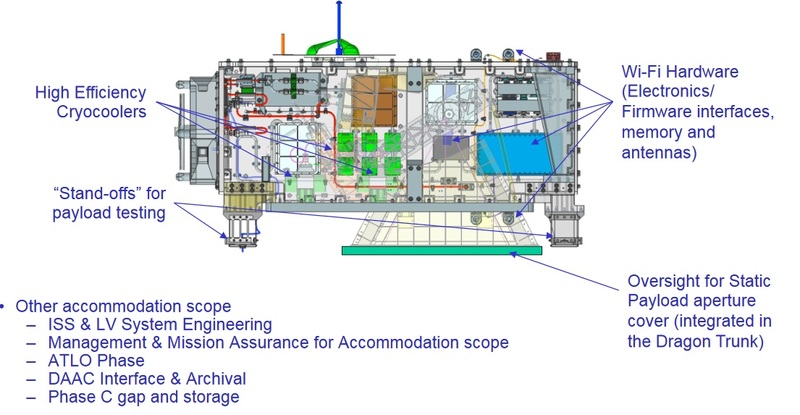 At Node 3, Feustel will find a prepared worksite as some setup for his task was already completed by Randy Bresnik in October through the removal of a pair of hand rails from the module’s end cone to free up the installation locations for the modified hand rails holding the External Wireless Antennas. 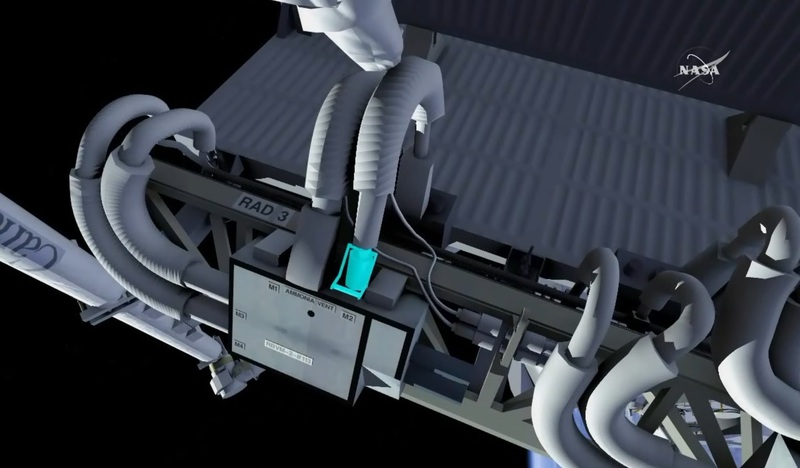 Employing a Pistol Grip Tool, Feustel will install the two In-Orbit Replaceable Hand Rails – one on the nadir side and one on the zenith side of the Node 3 end cone to provide proper WiFi coverage around the port hemisphere of ISS. Once the two antenna hand rails have been placed, Feustel will move the PMA cover currently in place over the Node 3 Port Common Berthing Mechanism to the side in order to connect a pair of power and data cables to the CBM outlets that will deliver power and data connectivity to the antennas. After installation of the cables, Feustel will return the PMA cover to its original configuration while Mission Control can complete an initial check of the antennas. The ECOSTRESS instrument, going by the full name of “ECOsystem Spaceborne Thermal Radiometer Experiment on Space Station,” is a 465-Kilogram Hyperspectral Infrared Imager capable of collecting high-resolution thermal infrared images of vegetation to measure the temperature of plants from orbit to better understand how much water they need and how they respond to stress. This is an entirely new capability for a space-based instrument and results from ECOSTRESS are eagerly awaited by the science community, explaining why ISS managers desired to have everything in place for the instrument’s arrival as early as possible. 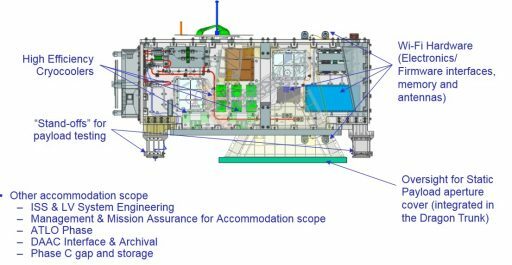 The $30 million ECOSTRESS instrument will be installed on Exposed Facility Unit (EFU) 10 on the Japanese Kibo Module’s Exposed Facility, also known as the Station’s Porch. ECOSTRESS will receive power and basic data connectivity for health telemetry transmission and command reception through its Payload Interface Unit on the Exposed Facility; however, for the high-speed science data link operating at up to 4.5 Mbit/s, ECOSTRESS will employ the Station’s external WiFi system. 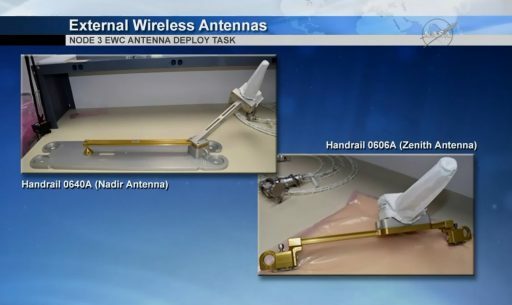 Expanding the External Wireless System through antennas on Node 3 (located just aft of the Exposed Facility) ensures that all EF payloads can send high-speed data to ISS. While Drew Feustel expands the Station’s WiFi, Ricky Arnold will tend to its cooling system as his first task will be the removal of a pair of ammonia jumpers from the Port Heat Rejection System Radiator (HRSR). 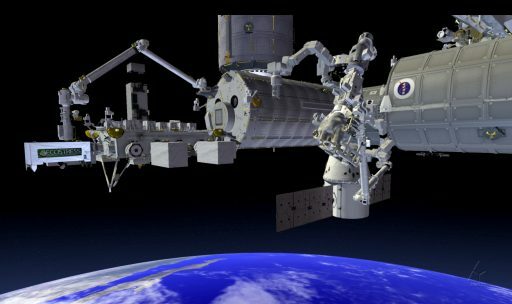 To reach his worksite, Arnold will take a ride on Canadarm2 – outfitting the free-flying end with an Articulating Portable Foot Restraint (APFR) before ingressing the arm to allow SSRMS operators Tingle and Kanai to fly him over to the Radiator Beam Valve. The retrieval of the two ammonia flex hose jumpers from the P1-3-2 Radiator Beam Valve Module (RBVM) is desired because extensive efforts by teams on the ground isolated these two jumpers as the most likely source for a small leak within the cooling loop. The P1-3-2 RBVM routes ammonia within Loop B of the Station’s External Thermal Control System that hosts large radiators, pumps and heat exchangers to remove excess heat from the Station’s cabin and radiate it overboard. Signatures from the ammonia accumulator of Loop B showed a slowly decreasing ammonia quantity over a period of several months in 2016/17 and work was carried out with the Robotic External Leak Locator in February 2017 which allowed the area of interest to be narrowed to this particular RBVM. French Astronaut Thomas Pesquet inspected the area in March 2017 and collected video to help teams pin-point the leak. After the RAD3 RBVM jumpers were identified as the likely source of the leak, Mission Controllers re-routed the affected flow path – one of six on the Port HRSR – and vented the ammonia lines in preparation for the retrieval of the jumpers. Returning the jumpers to the ground is hoped to provide insight into the exact location of the leak and its potential cause in order to further current engineering knowledge and prolong the life of future space-based thermal regulation components. To remove the 1″ and 3/4″ jumpers, Arnold will first disconnect a pair of heater cables that supply power for the line heaters to prevent ammonia from freezing inside the jumpers. He will then demate Fluid Quick Disconnects on the RBVM side followed by the radiator side and stow the two jumpers on the outside of the Crew Lock Bag he is carrying. These Fluid Quick Disconnects have been a particular trouble-causer in the past – having shown an inconsistent behavior in recent years as some cooperate when being mated/demated and others give teams plenty of trouble. 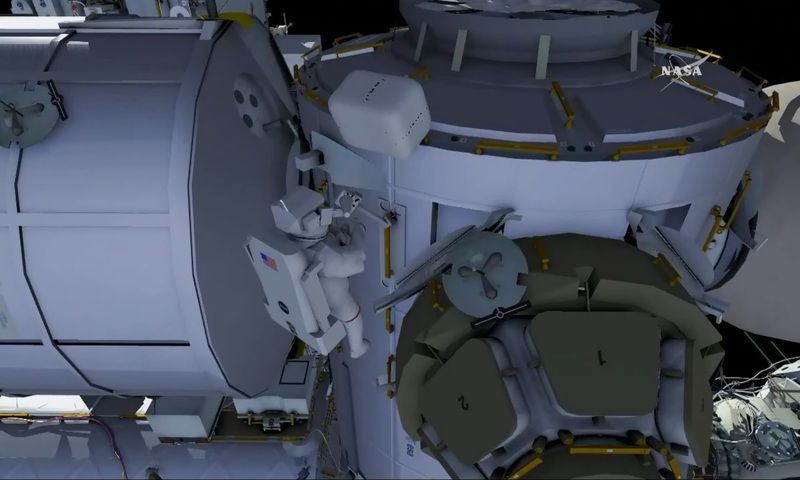 With the first two tasks complete, Feustel will pass by the airlock to switch tool bags while Arnold will continue riding the arm, moving to the next worksite on the zenith-face of the Port Truss where Camera Port 8 is located. Working together, the EV crew members will be tasked with replacing the External TV Camera Group (ETVCG) currently occupying the port because it lost its ability to pan & tilt upon ground command. 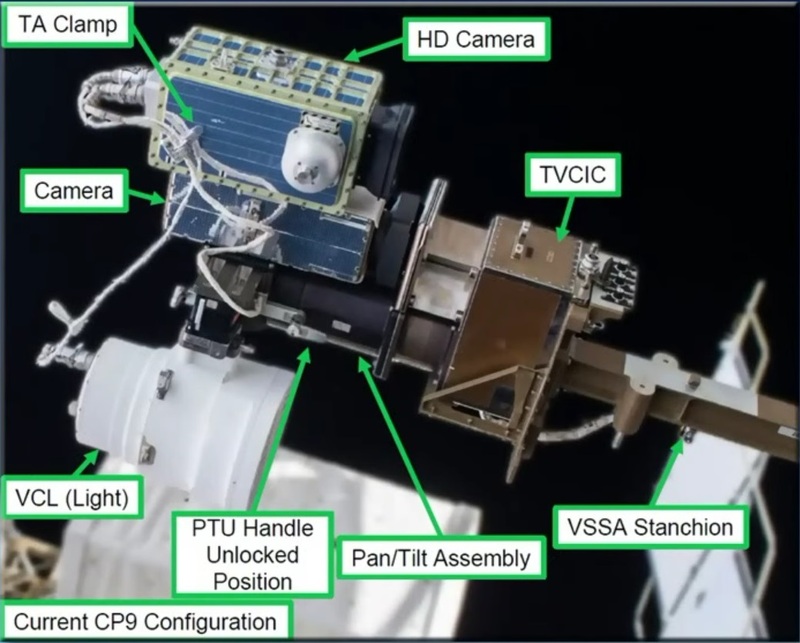 A typical ISS Camera Group comprises a stanchion and a CLPA (Camera, Light, Pan & Tilt Assembly) providing standard definition, 4:3 aspect ratio video from the outside of ISS. Some camera groups have been outfitted with an additional high-definition camera assembly over the last two years in an effort to bring ISS into the current decade where HD video has become commonplace. 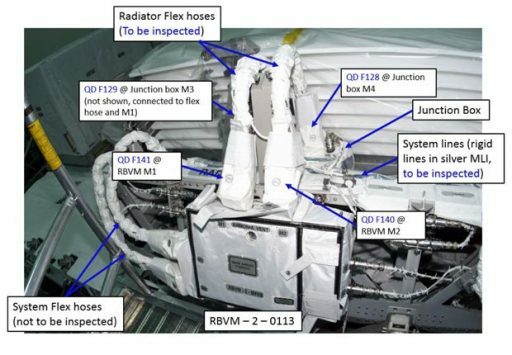 Camera Port 8 received its HD Camera on EVA-37 in September 2016 and recently encountered a failure within the Pan/Tilt mechanism used to move both the standard def and HD camera on ground command to provide situational awareness of activities ongoing outside ISS. To restore pan and tilt capability, the entire CLPA will be replaced by Feustel and Arnold. They will first move the CLPA into its stowed position and lock the pan/tilt system before disconnecting the HD camera power line and removing the HD camera from its slot as it will be re-installed on the new CLPA once it is in place. Next, Arnold will demate the CLPA connector and release two secondary & a central structural bolt with his Pistol Grip Tool and remove the entire CLPA. Arnold will hand the failed unit to Feustel who will give him the spare and pack up the removed CLPA to bring it back to the airlock. With both hands free, Arnold will soft dock the CLPA and drive the structural bolts followed by sliding the HD Camera Box back into place and mating electrical connectors to the light and HD cam. As a planned get ahead task, Feustel will translate over to the S0 truss and climb into the interior of the truss segment to retrieve an ammonia jumper that has been wire-tied inside S0 since around 2007 and was not used since. He will bring that jumper to the Pump Flow Control Subassembly on External Stowage Platform 1 at the Destiny lab in preparation for a future EVA that will relocate the PFCS. Ricky Arnold, after cleaning up the arm, will take the foot restraint to the same ESP-1 location to pre-stage it for U.S. EVAs 50/51. 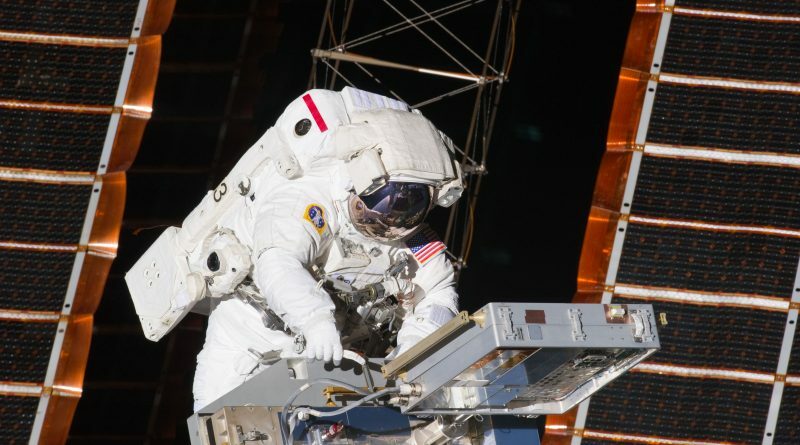 Additional get-ahead tasks may be performed as time permits to tackle some items lined up for future EVAs to decompress timelines and clear time for other work that may crop up before the next set of spacewalks.